By admin at Aug. 2. 2012. If you have any questions, would like information on joining our club, or just want to share something with us, we would love to hear from you! 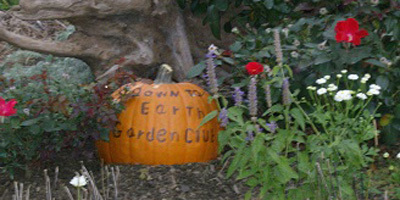 The Down to Earth Garden Club was founded to provide and maintain green areas for the city of DuBois. The group is entirely self- funded and the members provide the labor. 2. Pershing Parking lot: 4 in-ground beds and 5 pots. 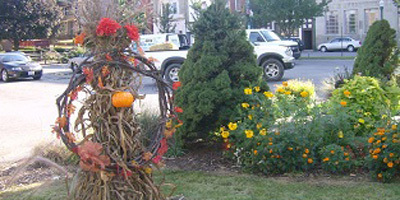 The lot is decorated for fall and pots are filled with greens for winter. 3. Reitz Theater: all areas surrounding the theater plus 2 pots. 4. City Building: all areas surrounding the building. c. Bed at the top of the stairs and areas along the stairs. d. Borders along the walls. 6. 4 small beds and a butterfly bed on the Beaver Meadow Walkway. 7. A teaching butterfly bed at Parker Dam, plus a pollinator garden. 8. The group also provides programs for the library, and other non-profits and provides funding and assistance with school and church programs and helps the Downtown Revitalization Group with their projects. 9. Two benches were added to the city scape in 2012-2013 at the city building and on the Pershing lot. The former was a memorial to Aline Huey. 10. We maintain a plant nursery from which we sell plants to fund our projects. We also gift wrap for donations at the mall every year. 11. Field trips are organized as per member’s wishes. There are usually a couple of field trips per year. 12. A summer picnic and fall dinner are part of the yearly program. 13. 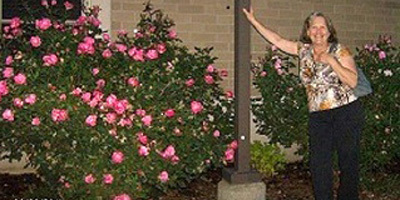 The garden club participates in the annual spring clean-up and various other programs sponsored by down town groups. We will answer specific gardening questions personally but if your email pertains to one of the articles consider using the comment area so everyone can benefit from the question. We are delighted to provide gardening info as a service but we will not fill out request forms to be added to your email list. We’d rather be gardening! Because of some peculiar requests we will not add links unless verification information is provided.